We’re a small, friendly and passionate team working on the future of Two Point County. We are based in Farnham, UK, and would like for you to be able to work on-site – though we’re very flexible with working from home! 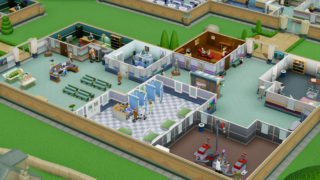 We are looking for a Unity programmer to join the team, to help design and implement features on Two Point Hospital, and our other upcoming sim management games. Ideally you’ll have a keen interest in AI and gameplay coding, but a breadth of knowledge of different areas will be very helpful. You don’t need to be super-experienced, but you do need enough knowledge of Unity and C#, and game development in general, to be quite self-sufficient. If you would like to apply for this role, please email jobs@twopointstudios.com, sending us your CV. We are looking for an experienced, competent Unity programmer to join the team, to help design and implement features on Two Point Hospital, and our other upcoming sim management games. Ideally you’ll have a breadth of knowledge of different areas of game development. Experience with console development, and/or online services development, would be very beneficial. We’re thinking over 7 years’ experience, but we would accept fewer for very talented individuals. You do need enough knowledge of Unity and C#, to be quite self-sufficient though. Two Point, Two Point Hospital, the Two Point Hospital logo and Two Point Studios are either registered trade marks or trade marks of Two Point Studios Ltd. Published by SEGA Publishing Europe Limited. SEGA and the SEGA logo are either registered trademarks or trademarks of SEGA Holdings Co., Ltd. or its affiliates. All rights reserved. SEGA is registered in the U.S. Patent and Trademark Office. All other trademarks, logos and copyrights are property of their respective owners. Steam and the Steam logo are trademarks and/or registered trademarks of Valve Corporation in the U.S. and/or other countries. All rights reserved. We use ShareThis to allow you to share our content on various social media platforms.